I always speak about loving everybody and sending positive messages. It is one of the best ways to be, it is something I have learnt over time. But every now and then a few people misunderstand the meaning of love. Loving the universe doesn't mean you should tolerate evil or things that are wrong. Loving people doesn't mean you should tolerate injustice and people being unfair to you. For instance, it is shocking to see how our nation is reacting to Pakistan. They have promoted terrorism against India, they have tried to attack us over and over again, they were behind 26/11, their ISI promotes terrorist activities in our country and yet we tolerate it and expect their leadership to do anything. They as a nation have been brainwashed by fundamentalist ideology. The Pakistani troops are firing at our nation, and yet we are doing nothing? We should instil fear in the minds and hearts of evil and make our nation so strong that nobody should even be able to think of attacking us. We need to destroy evil of all sorts and this has been taught to us in the Geeta, where Lord Krishna tells Arjuna how he should destroy evil while keeping love in his heart. It is our duty and karma and we shouldn't let emotions deter us from taking action. Every time we fear taking action, we need to close our eyes and think about the Lord. He is protecting us and wants us to destroy evil. Our politicians and leaders need to take a bold step and stand up - evil isn't just Pakistan, but even within our own nation. Rapists need to be publicly executed, terrorist should be immediately executed in public again - all this can be done by having love for humanity. In fact if this isn't done, this means we don't have love and respect for human life, for women and people. Fear was created by God for a reason. He created it to ensure evil is kept away, he created it so we can put it into all those who think of doing evil. To ensure evil is stopped. Only if evil is stopped can love grow. Our nation needs to stand up and rise above everyone else. We are blessed by ancient wisdom, it is our duty to share this wonderful knowledge with the rest of Humanity. We need to destroy evil around us first and then educate them and make them aware of our way of living and knowledge. But till we don't destroy their way of thinking and mis-guided thoughts we can not enlighten them with new ones. My ancestors hail from Sindh, which was lost during partition, and people all over the world are good deep down - it is just the circumstances and programming around them. It should be our mission to destroy all evil and then take over charge, change the education system, the leadership and ensure that Pakistan is run in a moderate and democratic way. It is time for not to be timid - but bold, aggressive and powerful! P.S. 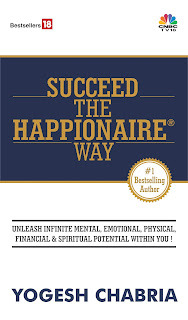 : Special Diwali offer on Invest The Happionaire Way and Happionaire's Investment Secrets For Women from Amazon. Must Buy - Must Gift - Must Read! What do you think about the Power of Y? Yes...very true..what do you feel of the recent blasts? What should be done?? ?